Following on from my previous post about the new “Made with IBM” TV spots shown during the US Masters, you can (update 2018: no longer) view all of the spots on YouTube. A number of publications have profiled the new spots such as the New York Times, Forbes, and AdAge. The 1:19 spot below sets up the series well. What is truly interesting about the 60 or so TV spots generated, is the use of IBM’s own employees for many of the commercials. As Cheryl and Mark Burgess pointed out in their book “The Social Employee”, IBM absolutely lives its brand through its people, affectionately called “IBMers”. The question and Ginni’s answer can be seen at the 47:24 mark on the video below, which talks about how IBMers are different and how IBMers aspire to live the IBM values. I’ve met Renee on a number of occasions and it is great that she has voiced this particular TV spot as she is passionate about social business. Katie is another IBMer passionate about social business. Many thanks for including our book, The Social Employee, in your blog. 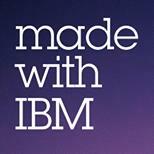 The culture that IBM has fostered is a proud one. “IBMers”, as you proudly call yourselves, is one that is open, vibrant, and lives their brand through their people. This is earned media at it’s best.